Let's celebrate Spring with a sailing vacation! 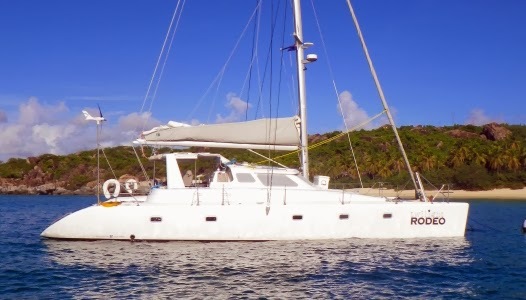 The charter yacht Frangines, a 55-foot Argo catamaran, has a special offer which runs through the end of August 2015. $1000 off standard rate. This means that an all-inclusive charter 6-person charter(with diving) is only $13,000/wk. Valid for new bookings of 6 nights or more taking place between now and August 31, 2015. They have a 14-foot dinghy with 60HP motor, waterskis for kids and adults, kneeboard, wakeboard, tube, kayak, 2 standup paddleboards (SUPs), snorkel gear, fishing equipment, underwater camera, floating mats, 32" flatscreen TV with DVD in the salon, iPod dock, wifi where available, laptop computer for guests to use, etc. Captain Rick is a dive master and 3 dives/week are included for certified divers, gear included. Twillight Rodeo, a 50-foot Voyage catamaran, is offering a $2000 discount for full-board charters taking place in July and August 2015. Valid for charters of 6 nights or more. Twilight Rodeo is a 50-foot Voyage catamaran with a crew of two. Twilight Rodeo is fully air conditioned and, while best for a group of 6, they can accommodate up to 8 guests in 4 Queen cabins. Three equivalent guest cabins have ensuite head/shower, while the 4th cabin located forward between the hulls shares a head and is only accessible from the deck outside (inquire). Twilight Rodeo has a 14-foot dinghy with 60HP motor, tube, wakeboard, 2-person kayak, 2 standup paddleboards (SUPs), snorkel equipment, fishing gear, hammock/deck swing, TV/DVD in salon, etc. The crew smoke. 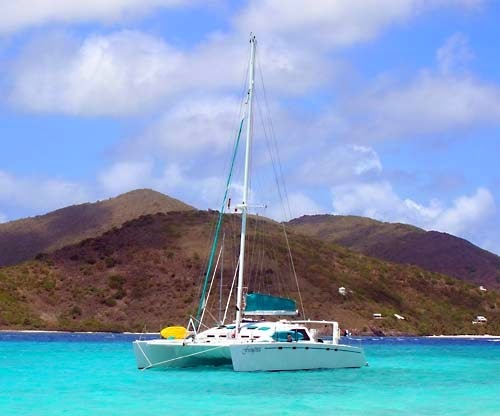 Come Sail the Virgin Islands this summer and save!